In about a month, if nothing is done, the federal government will hit its legal debt limit. There will be dire consequences if this limit isn’t raised. At best, we’ll suffer an economic slowdown; at worst we’ll plunge back into the depths of the 2008-9 financial crisis. So is a failure to raise the debt ceiling unthinkable? Not at all. 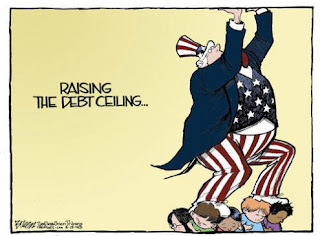 Many commentators remain complacent about the debt ceiling; the very gravity of the consequences if the ceiling isn’t raised, they say, ensures that in the end politicians will do what must be done. But this complacency misses two important facts about the situation: the extremism of the modern G.O.P., and the urgent need for President Obama to draw a line in the sand against further extortion. The federal debt limit is a strange quirk of U.S. budget law: since debt is the consequence of decisions about taxing and spending, and Congress already makes those taxing and spending decisions, why require an additional vote on debt? And traditionally the debt limit has been treated as a minor detail. During the administration of former President George W. Bush — who added more than $4 trillion to the national debt — Congress, with little fanfare, voted to raise the debt ceiling no less than seven times. So the use of the debt ceiling to extort political concessions is something new in American politics. And it seems to have come as a complete surprise to Mr. Obama. Last December, after Mr. Obama agreed to extend the Bush tax cuts — a move that many people, myself included, viewed as in effect a concession to Republican blackmail — Marc Ambinder of The Atlantic asked why the deal hadn’t included a rise in the debt limit, so as to forestall another hostage situation (my words, not Mr. Ambinder’s). Well, we’ve seen how that worked out. Now, Mr. Obama was right about the dangers of failing to raise the debt limit. In fact, he understated the case, by focusing only on financial confidence. Not that the confidence issue is trivial. Failure to raise the debt limit — which would, among other things, disrupt payments on existing debt — could convince investors that the United States is no longer a serious, responsible country, with nasty consequences. Furthermore, nobody knows what a U.S. default would do to the world financial system, which is built on the presumption that U.S. government debt is the ultimate safe asset. So failure to reach a debt deal would have very bad consequences. But here’s the thing: Mr. Obama must be prepared to face those consequences if he wants his presidency to survive. Bear in mind that G.O.P. leaders don’t actually care about the level of debt. Instead, they’re using the threat of a debt crisis to impose an ideological agenda. If you had any doubt about that, last week’s tantrum should have convinced you. Democrats engaged in debt negotiations argued that since we’re supposedly in dire fiscal straits, we should talk about limiting tax breaks for corporate jets and hedge-fund managers as well as slashing aid to the poor and unlucky. And Republicans, in response, walked out of the talks.